The RMS (RTA) refuses to adopt cost effective technology that would allow school zone flashing lights to be installed at all school zones. They say the lights will only be installed on a "needs basis". 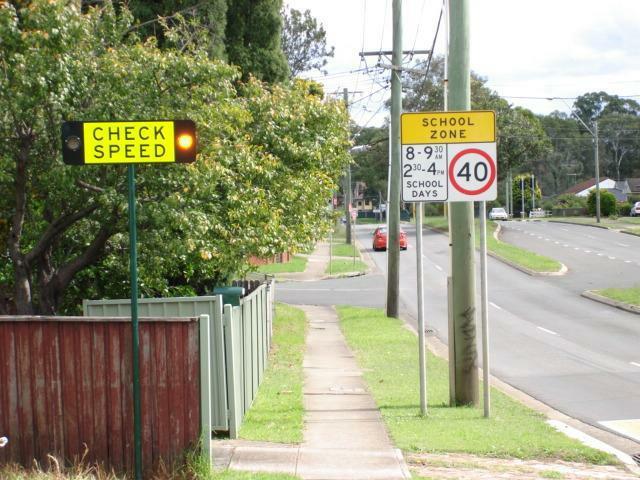 Children need the protection of flashing lights at every school zone where traffic can exceed 40km/h. Motorists need protection from unfair, revenue-driven fines. Click here to have lights like those in the photo below installed at your school NOW. They have already been installed at these schools. Sponsor lights at a school in your area. Email the Roads Minister to voice your concerns. Email this web site address to all your friends and to your school P & C.
Many motorists enter 40kmh school zones without realising that they are in operation. As a result children's lives are placed at risk and innocent drivers face large fines and possible loss of licence. The Government is installing speed cameras in many school zones but they are clearly designed to maximise revenue not safety. The RTA conducted a trial of school zone flashing lights from 2003-2006. The final report (p.67 last para.) found that the lights slowed traffic and reduced the risk of fatal accidents by 11%. In spite of that the previous Labor government said that flashing lights would only be installed on a "needs basis". It also said that the lights were not reliable enough (para. 3 first sentence). The RTA conducted another flashing lights trial at 100 schools during 2007 using lights that cost up to six times as much (up to $180,000 per school zone). The lights used in the second trial proved to be less reliable (98.2%) (p.2 para. 11) than those used in the first trial (99.3%). In spite of that the RTA spent $46.5M over 4 years installing those lights at just 4% of the school zones in the state, at a cost of $116,000 per school zone. Because of the outrageous cost it meant that 96% of school zones were left without flashing lights. Much cheaper, more reliable and more effective technology is available. Eight sets of lights were trialled by the RTA in Peakhurst and Lugarno for 4 years from 2006-2010 and proved to be 100% reliable. Since then over 70 sets of lights using the technology have been installed at schools across Sydney and have also proven to be more reliable than the RTA's systems. The RTA has been given the technology to use for nothing. Using that or similar technology the RTA could have installed flashing lights at every school zone in NSW for the above $46.5M. The RTA refuses however to consider cheaper alternatives in spite of the efforts of myself, the media and the Schoolzone Santa. The final report on the original RTA trial found (p.65) that simple lights such as those in Peakhurst and Lugarno (Type 1) reduced average traffic speeds by 50% more than the expensive lights the RTA is currently rolling out (Type 3). The previous Roads Minister, Michael Daley, stated on 11 December 2008 that he did not believe that flashing lights should be installed at all schools because drivers could become "desensitized". In early 2009 the previous Government spent $23M relocating the RTA head office from Surry Hills to sumptuous new premises at North Sydney with sweeping views of the city and harbour, yet it refused to spend any additional money to protect children at 96% of school zones. The current government has allocated $17M for the installation of lights over four years. By June 2015 it expects 1,390 school zones to have flashing lights, still less than 13% of the school zones in the state. Your support is needed if the campaign for flashing lights at all school zones is to succeed.